Your GP practice is a natural community hub. There is not a pill to cure poor housing, welfare reform, domestic violence and other social situations. Community resources vary widely in what they provide and how people can access them. GP teams, individuals and communities effectively working together. Your GP surgery now has a Community Links Practitioner who is attached to the practice on a full time basis. Their role will be to assist people to access community resources that will support them to live well. Your GP or any practice staff member can refer you to a CLP, or alternatively you can refer yourself. · Adapting to a diagnosis – Information about your health condition with practical support to understand your condition. · Living well day to day - Side by side support to focus on what matters to you to improve your life. · Facing challenges and crises – Support to feel confident and find the strength to prepare for life’s challenges. · Navigating systems – Advice on what’s in your community and how to make your choices happen. · Dying well – Personalised support to prepare for death or coping with loss. The Community Links Practitioners will provide the above service by using a Links Approach that we are aiming to integrate into the primary care teams practice. The approach will engage the entire practice team and help them develop the capacity to support self-management. This will be achieved through shared learning and additional access to up to date community information. The programme is a partnership between the Health and Social Care Alliance (the Alliance) and General Practitioners at the Deep End (The Deep End). 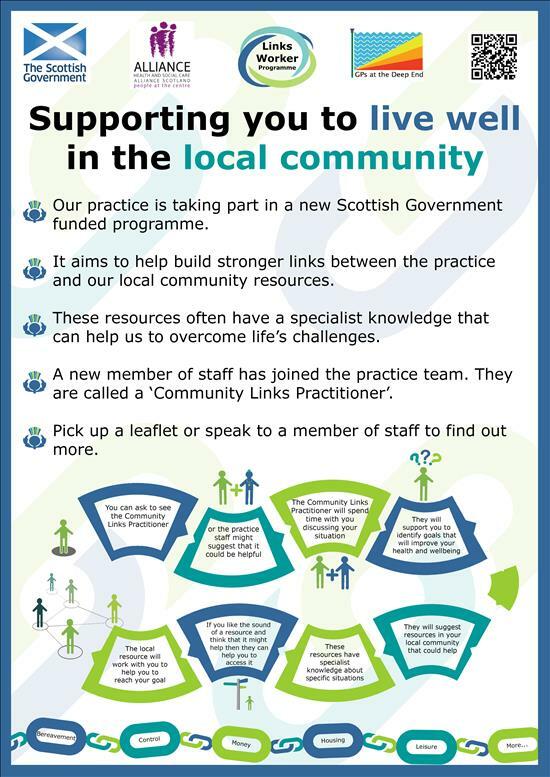 The Links Workers Programme is a Scottish Government funded programme which aims to explore how the Primary Care team can support people to Live Well in their community.